If the Charlotte Hornets end up making the playoffs, Jeremy Lamb deserves a special bonus. Lamb hit an incredible shot from beyond half-court at the buzzer to help Charlotte top the Raptors 115-114 in Toronto on Sunday. According to ESPN, Lamb hit the shot from 48 feet, making it the second-longest game-winning shot in 20 years. Tyreke Evans hit a 49-foot shot for the Sacramento Kings against the Memphis Grizzlies on December 29, 2010. 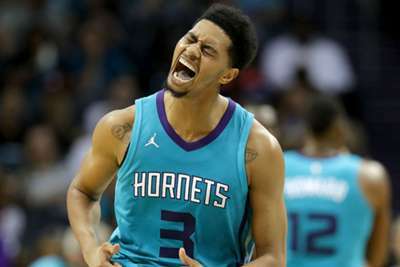 The Hornets (34-39) have won three straight and are now – thanks to Lamb – within two games of the eighth-placed Miami Heat in the Eastern Conference playoff race.